Fruits of his labor, vegan raw foodist in tree in newspaper! Student Sebastian Baum climbs a persimmon tree on the Santa Rosa Junior College campus to pick its ripe fruit. Baum explained that he is a "vegan raw foodist," meaning he only eats uncooked vegetables and fruit. 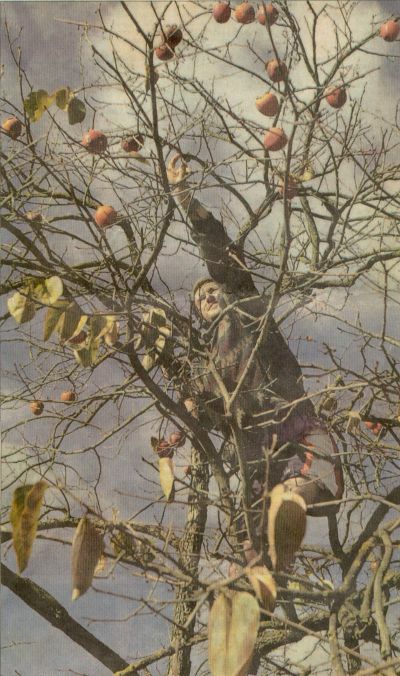 Baum said he gladly takes persimmons from people who have trees, but do not enjoy the fruit.